Now, I’m not going to tell you the name of the lender, because this is their job. Their goal is to make money and the more new mortgages they fund, the more money they make. 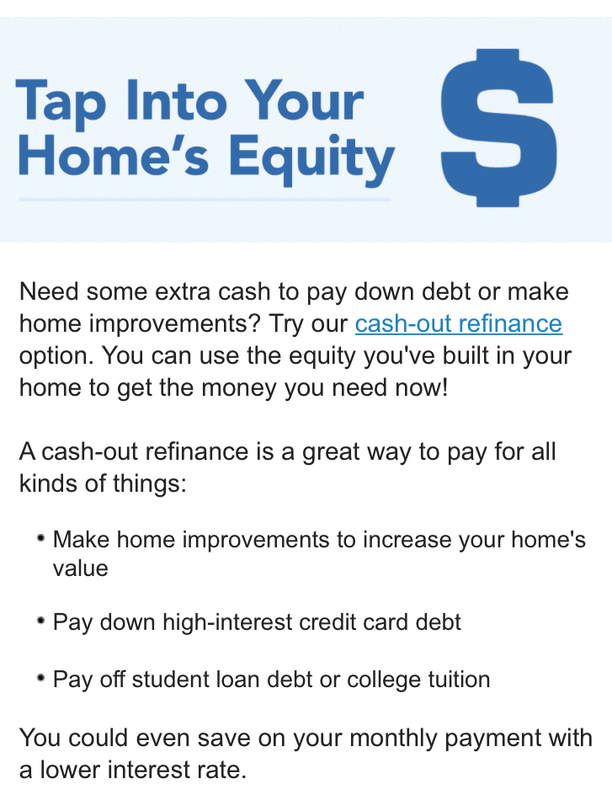 However, it does frustrate me that they try to influence people to go deeper into debt to remodel their home. That’s just irresponsible as a lender. If someone wants to remodel their home, they should remodel with the cash they have on hand. NOT a cash-out refinance! There could be some math that would show you that a cash-out refinance would be beneficial in terms of student loans or credit card debt. Especially with mortgage interest rates sitting at around 4.25% for a 30-year loan. Credit cards charge upwards of 16% to 24% interest and student loans are charging around 6% interest. So, it’s possible that the math could help you benefit in both scenarios. However, you can get a false sense of security and believe you did something. You no longer have credit card debt, but you didn’t learn how to control yourself! You just moved the location of the debt. You still have the debt and now you have open credit limits once again. This just gives you the ability to rack up more credit card debt. So, the numbers may show a benefit. But unless you change your habits, there is no benefit. Even with the small benefit that can come from cashing out some money and refinancing your mortgage, I don’t see a lot of benefits. Your overall mortgage balance has increased. You also increased the amount of time that you are in debt, by extending the mortgage and lowering the payment. For example, you may have taken your mortgage that had 22 years left on it and now you have spread out the payments over another 30 years. This lowered your payment, but increased your overall total interest paid over the course of the loan. In our personal case, we would be refinancing from a mortgage that has 12 years left and increasing the mortgage to 15 years. That’s 3 more years in debt. Not real appealing to me! Essentially, anyone could be looking at another 15 or 30 years of constant debt repayment. That’s 15 or 30 years stuck with a higher housing bill (no mortgage = lower housing costs). With a refinance, you extend the time that you are in debt. Personally, my wife and I want to get rid of our mortgage as fast as possible. Therefore, a marketing ploy like this will not affect our family’s decision to get rid of our mortgage as fast as possible. With all of that said, you may have been considering a refinance before reading this article. A refinance can be a financial benefit if used properly. My wife and I used a refinance about a year into owning our home. The interest rates had dropped and we used the refinance to lower our interest rate (No Cash-Out was included). The only reason I would refinance a home would be to lower the interest rate. We lowered our interest rate from 3.75% to 2.99% during our refinance. With the current interest rates, It does not make sense for our family to refinance, because we would be looking at a higher interest rate and we would be extending our time to pay off our home (currently January 2031). That’s a lose, lose in my book. When is it okay to Refinance? It’s okay when a refinance will lower the interest rate. Use the rule of thumb of 2 years or less to make your money back. With our refinance, we had a break even point of 14 months. With this article, I didn’t really dig into any numbers. I felt like it was important to get the message out that you shouldn’t be cashing-out the equity that you built up for a remodel. Don’t get caught up trying to keep up with the Jones’. The Jones’ are broke! Instead, keep taking one small step everyday on your journey towards financial independence. Each smart decision you make today will reap benefits in the future! Note: I plan to look at different scenarios in a refinance and share the results in a later post. We are looking a couple things for the future and trying to make a decision on the right path forward for our family. I will share this journey and details of my calculations at a later date. Older PostTravel Hacking: Can It Really Save You $7,000 or More in Travel Expenses?